Produce stays deliciously fresh and perfectly ripe in these bright banana storage bags you store in the fridge! 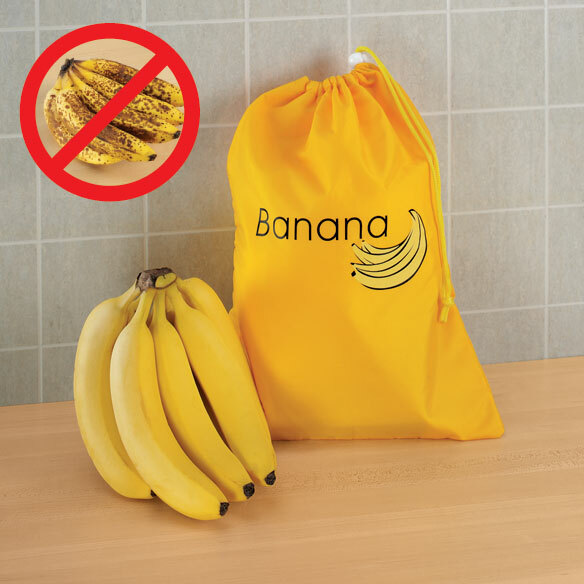 Drawstring banana bags keep oxygen out, preserving bananas up to 2 weeks. 100% polyester; wipe clean. 15"L x 11"W.
I saw this banana saver for a long time before I bought it and now I wonder why it took me so long. Bananas do stay fresh for an extended period of time. Really yellow bananas stay fresher for much longer than those that are even a bit brown. This actually Does keep the bananas good to eat for several days. It was great not to have the last 2 bananas of the bunch go bad because we didn't eat them right away! Saves $ as well as food! We always had to throw over-ripe bananas away. Since purchasing the banana storage bag four months ago, we have not thrown the first banana away. We do have to remember to take a couple out of the bag two days before and set them out so they will ripen to eat. We are very pleased with this product. The pouch really works to keep my bananas fresh. I never realized how delicous cold banans were, until now!! I love it -- it works! everything is great about it! or place in the veggie bin. Bananas look fresh and do not get spoiled for much longer time, 5-7 days easy. THE BANANA BAG REALLY DOES WORK!!! !....the outside gets very dark but the inside stays PERFECT!! !....sooo glad I purchased TWO!!! Banana storage bag GREAT. I put week old bananas in the bag expecting to throw them away. The outside turned a medium brown and I was surprised when I opened the banana, it was fresh and eatable. Best food preserver I have ever had! I find the banana bag just perfect for keeping bananas in pristine condition, and plan to give them to family as gifts in the future. So great I am telling all my friends! I have owned this for a year and now purchased two for gifts. They make bananas last longer. Mom gets a banana every day and now I can shop weekly instead of daily. The outside of the skin may look unpleasant at times but the banana is always great. Haven't bought bananas yet. Can't wait to use this bag. Have used this bag threw 2 rounds of bananas, I am not disappointed with the results, going to give them as gifts from now on. for a couple of weeks in the frig. I purchased one of these months ago. It works so well that I purchased additional bags for gifts. I am not used to storing bananas in the refrigerator. This takes some getting used to. This really keeps your bananas fresh longer. I had my doubts about this item. But it really works. I put 3 bananas in the sack & left it on the counter. On the 5th day the fruit was still good. I put 3 in the sack & put them in the fridge. They lasted even longer. Now I can get a bunch on bananas instead of a couple. If this works with bananas....think of the other fruit that this bag can keep fresh. I was skeptical also until I read the reviews. Decided to try the banana bag to see for myself. Bought 6 bananas, put 3 in the bag and left 3 on the counter. Within 2 days the bananas on the counter were very ripe while the ones in the refridgerator lasted over a week. I was a believer then and still use the yellow bag. The bananas still turned brown but the inside was still good. I use the banana bag for its intended purpose. The bag keeps the bananas fresh. This bag is almost too good! I find I need to take a banana out of the bag and fridge each morning, so it will be ripe enough to peel easily for breakfast the next day. Very helpful product. It's pretty too. So far, I am pleased with this product. I've tried everything else to try to keep bananas from turning ripe too soon. This seems to be working. Mu husband is the banana eater and he loves it, says they taste better cold and last longer. I wish it had a velcro closure instead of a drawstring but we are pleased. bananas in the refrigerator for four days now - and they are still yellow skinned and good. In fact, I am buying the bags for Christmas for my three adult children. WE USE IT KEEP BANANAS IN THE REFRIGERATOR. THEY STAY FRESHER LONGER, ESPECIALY IN WARMER WEATHER. While the keeper says to store the bananas in the refrigerator I simply put it on the counter. It definitely preserves the length of storing bananas before they "turn ugly" and the sack isn't bad looking. I like it. I can buy a bunch of bananas and have them last almost two weeks. Bought two more weeks for my vegan members in the family who love banana slushed. I was throwing bananas out frequently. This bag has helped them last longer, with less waste. Bananas ripen much more slowly when these bags are used. I just bought my first bananas so I really don't know how it works, but from other reports I think it will really help me keep fresh bananas and not make so much banana bread! I use mine all the time, bananas do last a lot longer. Don't let looks throw ya, they may look bad on the outside but inside they are fine. I have 2 an have bought more for gifts. Good buy for good price. This has saved a lot of overripe bananas for me. I don't always have time to bake banana bread much less eat all of it!! I got one for my sister-in-law who lives alone and just got so she didn't eat bananas because she couldn't keep them fresh. She loves it!! Bought this bag on a lark and can't believe how well it works. Also enjoy seeing the bright yellow everytime I open up the fridge. Just purchased another one for my sister. The bag was fairly useful, though I doubt that it would keep bannas fresh for the two weeks promised. One week is more lke it. For storage. Keeps bananas too cold. A brown sack or a cloth shopping bag did as well as this bag. was hoping for more. Have not had an opportunity to try it yet to see if more effective than just putting bananas in refrigerator fruit bin. I like bananas firm. I buy them green. After using this bag once I cannot say it stops them from ripening, which is what I would like, but it did slow down the process. Better than nothing and I have hopes it may be as good if not better the next time. Followed directions and didn't 't protect bananas more than an extra day. I have another one I've used for years and decided to get a new one. This bag is no better than storing it in a plastic bag. I'm very disappointed in the quality. I put the bananas into the bag and in a week tried them and they looked pretty good from the outside but when I peeled the skin there were big spots at each end. The banana was edible but had to cutoff about 1/4 of the banana. My bananas only lasted 2 days then turned black , and on the 4th day the last one was black all the way thru. I can leave them on the counter in my Florida kitchen for 3 days, then i have to refrigerate them. I was very disappointed with this product. I tried 4 bananas in the bag and by the next day they were black and hard. I could not eat them. So I will not be using the yellow banana bag for bananas. I keep my organic bananas at room temperature. I usually use a Debbie Meyer bag or such. Thought I would try this bag. It didn't keep the bananas but two days before they already spotted significantly. I like to buy them with a little green to last 5 or 6 days. But this bag doesn't do the trick. Sorry. If you want, this does make a nice storage bag - if you like bright yellow. This is ageat product-however when washing the item it is difficult to get the "stuffing" back in place. the "stuffing material needs to be stitched in place so when washing the item it will not be all jumbled up into a ball. If this was tested in the making of the product this problem would not happen. This product did not work. The bananas still turned brown. When I receive the bag it looks nice ,and reads the instructions, it says to put the bananas in the bag, then refer agate it ,which I did ,but all the bananas got black and I it was wasted could not eat them ,tell me the correct thing to do. Does not work as described. Bananas gone black after 4 days. why??? The bag works and keeps the bananas from overripening, but it takes up too much room in the fridge and we don't really like cold bananas. unappetizing. Won't use it again. I do not like this product. You cannot pull the drawstring tight as directed. I don't like to eat cold bananas. I also don't like seeing the dark skin. I think this bag was made to "look like" the original that was developed. My friend had one and she kept it on the counter. I could put bananas in the refrigerator without this bag if I wanted cold ones and try to slow down ripening. So...thumbs down on this. I feel cheated. We were not happy with the way the bag kept the bananas. I bought & tried but banana turn brown with in day in fridge. We use a lot of bananas! This appeared to be just what we needed. We found that the bananas ripened faster if anything at all. A pricey waste of good money! Did not perform as advertised, My bananas turned black in two days. This bag does nothing: putting the bananas in the fridge is what makes them last longer. Yes, the skins turn black, but the bananas are still good to eat (for awhile). Oxygen is not the enemy. Ethylene gas is what ripens/overripens fruit, so closing them together in a bag might even rot them more quickly. The banana bag did not keep the bananas nice and yellow like the advertisement. Instead, the bananas turned black on the outside. When peeled, the inside of the banana was not black, but it had an odd taste. The bananas did not keep any longer than they usually do. I will keep the bag because it will make a nice little tote bag for a swimsuit or other use. Very disappointed. Does not preserve the bananas from turning as claimed. My banana did not last in fridge at all,not worth buying. This banana storage bag was a disappointment and not worth having. If you need maximum room in your refrigerator it will also interfere w/this unless you are storing a few bananas. I can't see that it makes any significant difference in the length of time the bananas stay good. Hanging them on a stand works just as well and doesn't take up so much room on the counter. Returned item, has to be refrigerated. I used this bag as suggested and put my bananas in the fridge, but it not only changes the taste but makes them to cold. I do not like the product at all. I thought it was a bag to keep banabas in, in a cabinet. I specifically bought bananas to try this product - It did not keep the bananas fresh even two day, much less two weeks. I waited a long time to get this product and now am so sorry I purchased it. I do not like this product.Cold bananas? I didn't know you had to put this in the refrigerator. I don't like cold bananas and it took forever for them to get to room temp. I'm out of the mood to eat one by then. would not buy or recommend this.. Does not live up to advertisement. Bananas turned black in this bag in the fridge, overnight. Did same when not placed in the fridge. I was really hoping this bag would keep my bananas in good condition for longer, but I was disappointed. After just 2 days in the bag in the fridge, banana peels were black, & fruit itself was edible, but a bit brown. Guess What? The exact same thing happens if you put bananas in the fridge WITHOUT a bag! So, it's not at all necessary, and since it is bigger than a bunch of bananas, takes up a lot of space. Waste of money! This did not keep the bananas any fresher than just putting them in the refrigerator. Bad buy. This was s total waste of money! Supposedly bananas were to last longer if stored in this special bag-NOT TRUE! Don't bother with it! I am usually very satisfied with things I've purchased from Miles Kimball, until now! So, buyer beware! This works.no more throwing out over ripe bananas. I love having good looking bananas with cereal or just by themselves and this storage bag helps with the look I like. I need to buy bananas for one week each time go to the store. Sometimes they get too ripe and mushy. I hope this will help. My sister purchased this bag and it works great. I am getting one for my daughter. Bananas get brown faster than we can eat them even though we buy them green. We eat 3 a day. I have found it to be quite useful - it works! The bananas get ripe too quick, and I have tried other items that claim to keep them fresh....but do not. IF this does not work, I will send it back. I like bananas and I like them FRESH! I want to extend the life of my produce. I buy bananas frequently and hope this will delay over ripening. To hold bananas in the fridge? This bags are very good for keeping bananas fresh for a long time. I was hoping to find a banana bag in the grocery store, and your add popped up. My Banana's is always ruining, so I thought I would try this. Tired of gnats in my house, hopefully this will keep them away! Want to see if this is true!! !